You are here: Home / EU - Regulating Biking / When MEPs Attack! 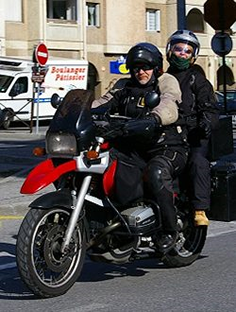 UKIP MEP Marta Andreasen has accused the Motorcycle Action Group (MAG UK), and in particular Paddy Tyson, MAG’s Campaign Manager for attacking her stance on the EU proposal for the Approval and market surveillance of two – or three-wheel vehicles and quadricycles regulation proposal, which is that it should be thrown out. According to Ms Andresen, Paddy Tyson branded her position as simplistic. You may be asking yourself why we are reporting about a storm in a European Tea Cup, between MAG and Marta Andreasen? Why should we care? We have previously written to Ms Andreasen, on her blog. In one instance our comments were published and another which she deleted in response to her opinion on the proposed regulation. Elaine writes: “I really do not understand your comment nor the reason you made it. Right To Ride is a small Northern Ireland organisation and with all the will in the world, we do not have that power to “bring into the need for legislation”. Whether there is a need for this legislation or not is neither here nor there – that is not what we have stated. We simply comment and provide information to motorcyclists regarding the proposal and its subsequent passage through the parliament and Council. Or the fact that you state “Right To Ride will do what they can to rubbish my views”. I did in fact write to you a few months ago to comment on your petition because I believed that you had misunderstood the Commission’s proposal and in that respect, I would agree with Paddy Tyson that your argument is simplistic. Although it is true that we commented on your spelling mistakes, that was not rubbishing your views. I note that you removed my comments the last time I posted on your website”. From what we can read in this blog and from other blogs on her website, she is claiming that the pressure that she exerted saw the Internal Market Committee backtracking on anti-tampering and mandatory ABS, which has led to an impact assessment on these matters. Clearly Ms Andreasen has made a huge mistake by attempting this somewhat ignoble tactic. The title we have used throughout the discussions relating to the EU Commission’s proposal has been “Regulation Not Strangulation”. Simply, we do not like unnecessary regulation, however we believe that some regulation is required in order to protect consumers so that any motorcycle supplied by manufacturers is safe and will last without falling apart or the engine blowing up. As the United Kingdom is part of the European Union, these regulations are decided on in Brussels. There are, as Paddy Tyson rightly points out, aspects of the proposed regulation that makes sense, e.g. the provision of repair and maintenance information; Bringing motorcycles in line with the automotive industry in terms of emissions levels (in other words, ensuring that the motorcycle industry produces cleaner more fuel efficient vehicles); Outlawing the 100 bhp derogation. Exemptions for amateur build vehicles etc. However what seems more apparent to us is that she’s sniffing around for support for her extreme anti-EU stance. Whether we agree or not about the U.K.’s membership of the European Union, this is not the time nor place for this debate. At Right To Ride we choose to work through the system by having direct discussions with legislators without radicalising the issue or scaremongering. This appears to be exactly what Ms Andreasen is doing, which is not a service to motorcycling, rather it is a disservice and in our opinion, she is naive and out of touch. Further to the above – we received notice today regarding the Impact Assessment from Malcolm Harbour’s assistant Stephane Reynolds. We did not receive any information about this from Ms Andreasen, but then there was no reason to because she is not involved in the process. The three-part impact assessment of amendments proposed by the IMCO Committee to three measures contained in the European Commission’s proposal for a “Regulation on the approval and market surveillance of two- or three-wheeled vehicles and quadricycles”. The first part concerns the fitting of an anti-lock braking system (ABS), the second part concerns On-Board Diagnostic systems (OBD), the third part the speeding-up of the introduction of subsequent stages of European emission standards for L-category vehicles. According to Malcolm Harbour’s assistant, “From a first read, the cost benefit analysis is negative for all three IMCO proposals. It is very negative for mandatory ABS on scooters and bringing the introduction date forwards by a year, very negative for OBD stage II, and only just negative for bringing EURO4(5) stage forwards, deleting EURO3(4) stage. What does this mean? It means that based on the findings of the impact assessment, the amendments put forward on the above will most likely be ditched at the next IMCO meeting. This document will be discussed during the next full session of the IMCO Committee on 28th February from 0955 to 1035 (Brussels time). Yes Ms Andreasen is a UKIP MEP, sorry if that wasn’t apparent. While a number of British MPs may have expressed a view that the Commission’s proposal – note the word “proposal” is best thrown out and started again – the fact is that each political group in the EU parliament was represented in the IMCO committee by an MEP – either rapporteur or shadow rapporteur who was expressing the views of their given group in that committee and put forward various amendments. This is of course with the exception of the UKIP’s representative in the IMCO committee – Trevor Colman, who did not table any amendment. Not sure about wide bars or long front forks as there has been no proposal either from the Commission or from MEPs to ban them. There was a suggestion by the Commission to test for extreme style motorcycles produced by mass manufacturers, perhaps that got lost in the hype that been bandied around. Could it be that Ms Andreason represents UKIP or a similar party? In any event, a number of influential British MPs have expressed a view that “this bill is best thrown out” but with the proviso “and start again”. There is far too much confusion over terms such as meaning and purpose of ‘on board diagnostics’ and does ABS mean ‘advanced braking system’ or ‘antilock braking system’ . Also, whether ABS, whatever it means, is beneficial or not to riders. While Ms Andreason’s view may be simplistic, that could be seen as praiseworthy. 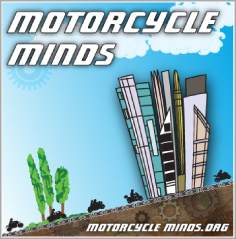 Most bikers have a simplistic mind. They simply dont want restrictions or compulsion which they simply do not understand forced on them by a body of unelected bureaucrats . What do Brussels bureaucrats know of the effects of wide bars or long front forks on a bike? The same people probably think long forks , as on Harley and other ‘chops’ are an aid to speed! Mike Baker.